Vintage looking and ultra reliable, this long range electric scooter comes with a 10.4Ah battery for 20 miles range or the extra large 18.2 Ah battery that will last for 35 miles! Front and rear suspension promise a smooth ride. It can be stored away in seconds with the perfectly designed folding mechanism. The 36V 350W brushless hub motor delivers a powerful ride and speed of more than 20mph. Front and rear LED lights, its advanced display and speed controller plus a USB charging port for your phone make this the perfect companion for your long commutes. Get this electric scooter in matte black, old school orange, or bronze. Add a seat for more riding comfort from our accessories menu. Great scooter for a big guy like me. Had it for a week so far! looking forward to more rides! I've purchased this scooter from a retailer in China three years ago before these came to the USA. I added non-slip tape to the board which helped. I also adjusted the brake lever position. Excellent scooter! After three years I think the max battery charge is starting to show it's age. I plan to replace. Highly recommended!!! Glad to see these being sold here! Bought this scooter a few months ago on preorder. It surpassed my expectations by a lot! It's fast - I am only 140lb and I can hit 22mph. The battery lasts forever - I did 30 miles in one day and did not run out. Great front and rear light so I can comfortably ride at night. Powerful - the 36V 350W brushless hub motor delivers speeds up to 20mph. 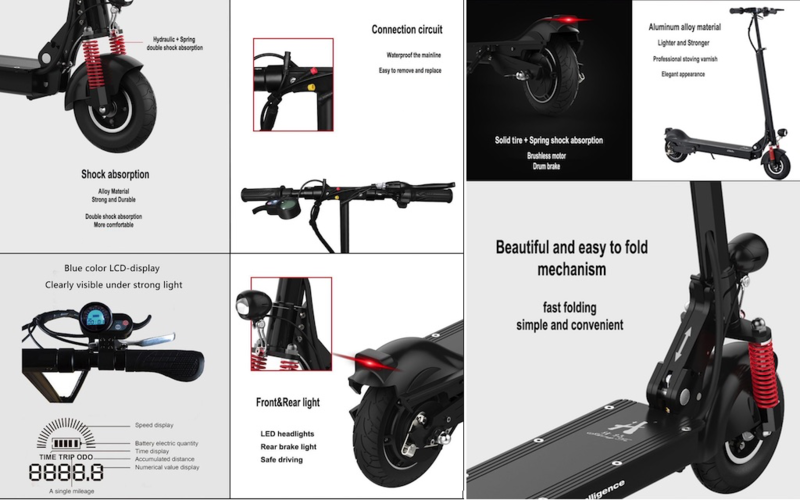 Loaded with features - LED head and taillight, USB charging port for your phone, advanced controller and display with battery status, speed, distance, voltage, etc. Seat optional - tired of standing up? Get the optional seat, easy to attach, for ultimate cruising (check our accessories menu). Available in multiple colors and with or without seat. At fluidfreeride.com, we believe in honesty, customer service, and awesome electric scooters.